After teasing a new game a few days ago, Compile Heart has announced the title in newest issue of Famitsu. 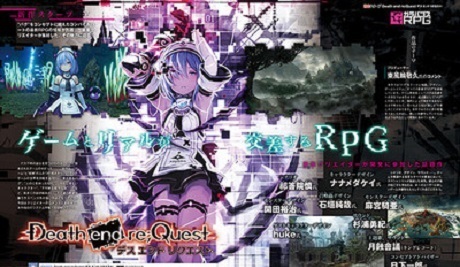 Death end re;Quest which is part of the Galapagos RPGs which include the Fairy Fencer games and Omega Quintet, will be coming to the PlayStation 4. The game’s story focuses on a Shin who is a game programmer that receives a message from a message from a missing game developer named Shiina who has been unable to escape from a virtual reality using MMORPG called World Odyssey. It was mentioned that the game’s theme is around bugs that are both inside of World Odyssey and out. The game will have turn-based commands during which you can act freely. In battle you can knock enemies back into others for greater damage and to gain an advantage on them. You can install games from reality to add different genres when you fight. Also with the theme being bugs, the game will have things such as invisible floors or walls which you can walk through which you can use to find items or explore. To go along with that exposure to bugs will contaminate characters at a certain point give them stronger attacks, but if your character becomes too contaminated it will kill them. No release date has been given yet for Death end re;Quest.